Wales 1st class missing yellow update. 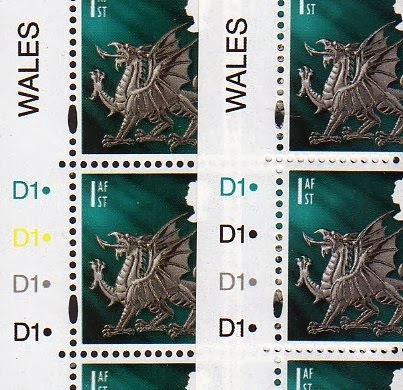 In an earlier post I raised the question of the missing yellow on the 1st class Wales definitive. I've now had an official explanation as to why black has replaced yellow, confirming that yellow is unlikely to be used again. "The first example shown refers to a printing which took place at the De La Rue Byfleet site ( formerly House of Questa). In this print a ‘greenish-yellow’ (Gibbons colour reference) was used. When the stamp came for reprinting, De La Rue had relocated stamp printing to the Dunstable site. During the proofing it was felt that the image was too yellow and consequently the colour was replaced with a black. The standard print then became blue-green, silver and two blacks. "In terms of numbers we tend to do one print per year of these stamps. Can’t give you the figures for that period." So, far from being an error as has been suggested elsewhere, the change was deliberate and all future printings will have two black cylinders and no yellow. Update: .... until, that is, the stamps were printed by Cartor who reintroduced the yellow plate. Golden Machin Horizon labels lose their teeth. Smilers for Kids - limited success?